We want to concentrate our awareness in these three areas so that we free ourselves from our limited, biased perception, in order to touch the reality fully. Emptiness always has an object, it’s always empty of something. When a cup is empty, we say the cup is empty of tea, but looking deeper, the cup is full of air. In the Buddhist teachings we say everything is empty, it does not mean things don’t exist, it only means things are lack of a separate, individual self. For example, when I use a stick and hit it against the singing bowl, it creates a sound. The sound is not separate from the stick, the signing bowl, and the action of hitting. 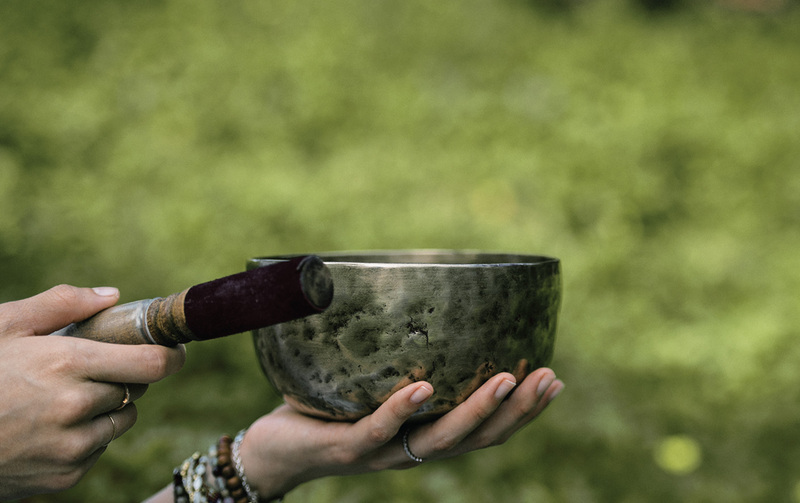 It is not separate from the particles in air that allow the sound vibration to move from one place to another, the sound is not separate from having a pair of healthy ears to perceive the sound, and is not separate from having a healthy consciousness to cognize the “sound”. So when I hit the stick against the signing bowl, the sound is not separate form everything else. So we can say the sound is empty; it is empty of a separate self; we cannot find the “soundness” in the sound. Looking deeply, we can see that suffering and happiness are also empty, empty of a separate self. If we do not know suffering, we do not know true happiness. The two are not separate from one another. In a relationship, sometimes we make the other person suffer because our mindfulness is not rooted. We are not able to apologize to the other person because of our pride. You think other’s suffering is separate from you, but if you look deeper, you will notice when the other person suffers, you also suffer; when the other person is happy, you are also happy. Both of your happiness and suffering are not separate. When I have an argument with my husband, I practice looking into his suffering, and seeing that his suffering is also our suffering. The way for me to overcome my pride and apologize is to see how my happiness depends on my husband’s happiness. When we practice seeing emptiness, we see that everything is a total sum of its causes and conditions. There are many conditions that make happiness possible, and if there is not enough conditions for happiness to take place, then we suffer. So when we are not happy with the present condition, we need to practice seeing how the conditions are brought about, we can look deeper into the conditions and change the conditions so that happiness is possible. A sign is a form, or a formation in our minds. Signlessness is translated as 無相 in Chinese. We live in a world of forms, and it is easy to mistaken the form as reality. For example, if I pour water into a circular mug, we say the water has the form of roundedness. When we pour water into a square mug, we say the water has the form of squareness. Then we pour the same water into a triangular mug, we say now the water has the form of triangle shape. If we freeze the water, we say the water has the form of ice, and when we heat up the water, we say the water has the form of steam. By forms these manifestations are very different, however, in reality, they are all H2O. Most of the time, we only pay attention to the forms, as a result, we see things in a dualistic way – that the squared water is different from the rounded water, which is different from the ice, and different from steam. Everyday, we get caught up with signs; I am different from you and she is better than me. If we see beyond the forms, in reality, the water can take different forms, but they are of the same essence. Our practice of signlessness is to see beyond the signs. Signs have their purpose; we need signs in order to communicate and to make sense of the reality. We need signs in order to make an abstract idea into meaningful information (I can describe my feelings, we understand what gravity is), and we need signs to help us distinguish a tree from a cat. Without signs, the society cannot function and language cannot be formed. However, signs do not represent the whole of reality, signs by nature is dualistic, but the reality is neither dualistic nor monistic. If we get caught up with signs, we are caught up with higher, lower, coming, going, birth, death, you, and me etc. Most of the time we get caught up with signs, that’s why you think you are different from Nikita because she lives in a different apartment, she has a different job, and she has a different personality as you. When we only look at our signs, we are different. However, if we look beyond the signs, the ultimate truth is that you and Nikita are both empty. You are both empty of a self because both of you are made of non-self elements such as the sun, carrot, rice, water, soil, mineral, and air, etc. Relatively speaking, Nikita and you are different, however, in reality, both of you are made of non-self element. You are neither different nor exactly the same. The practice of signlessness allows us to see the nature of our reality. When a woman fell in love with a man, she saw this man as gentle, kind, caring, and attractive. However, after dating this man for a year or two, she did not see this man as kind, gentle and attractive anymore, instead, she saw him as angry, impatient, and selfish. The man had not changed, just that the woman saw part of the signs of this man when they first started dating, and slowly, she saw other signs of him. She assumed the signs she had noticed in the beginning was the reality, however, she was not able to see his other signs until dating him longer. Each of us has many different roles, for example, Anita is a student in this class, she is an accountant when it comes to work, she is a teacher at her health center, and she is the food provider to her pets. So if I only know Anita as my student, I am not seeing the whole of Anita, there are many more behind the sign as a student. When we get caught up with signs, we say Anita is this and not that, then we can get caught up with right and left, top and bottom, beautiful and ugly, higher and lower. In reality, Anita continues to evolve, when conditions change, she changes too, Anita is who she is now because of all the non-Anita elements. When we practice signlessness, we want to train our eyes to see the empty nature of everything. Beings, non-beings, animals, plants, are just as empty. Just that the forms turn out to be different, it does not mean by essence we are different. By signs, we distinguish a good person from a bad person. However, a bad person is only one sign of this person, it does not represent the whole of this person. If we only see the sign of this person as bad, we are not able to see that this person also has the Buddha nature. He is unkind now just because he does not have the right conditions to allow him to be kind. If you look deeper, you will see that this person will be kind with the right causes and conditions. He is who he is now because of all the unwholesome conditions. If we have exposed to the same causes and conditions as this person, we can also become unkind. When you are able to see beyond his forms, you notice he is conditioned just the same way as how we are conditioned, this insight nurture your compassion towards this person and you no longer have aversion towards this person. With the compassion, you feel that you can help this person by watering wholesome seeds within him so that he can also enjoy the peace that’s hidden within him. We want to practice in a ways to see beyond signs in order to touch the reality. To see beyond signs, we don’t need to go anywhere, we have to be in the world of signs, right here, right now. By looking deep into the signs, we can see that signs are made of non-sign elements – without our consciousness, there will be no signs, without a subject, there will not be an object, signs and non-signs inter-are. Mountain is mountain, mountain is not a mountain, mountain is a mountain. The first mountain refers to the sign “mountain”. A mountain is different from a valley, which is also different from a building. We have a certain concepts that help us distinguish a mountain from a valley and a building. The second mountain refers to seeing how the mountain is made of non-mountain elements. When you look closer into the mountain, you will notice the mountain is made of soil, trees, rocks, earthquakes, earth formations, the valleys, the mountain is also made of the sun shine, the ocean, wind, the rain… The mountain is made of non-mountain, so the second line refers to seeing the non-self nature of the mountain. The last mountain refers to how the signs and the non-signs inter-are; the mountain is a mountain because of all the non-mountain elements, because of all the non-mountain elements, that’s why the mountain is mountain. With practice, we see the signs, see beyond the signs, and touch the reality. A student said to me the other day, “ I want to make sure that I always do my best.” I asked her to tell me precisely when she knows she reaches to “her best”, and how she knows she gets there. She thought for a while, and asked, “I will never get there, right?” “Probably.” I replied. “Better” or “best” is just a concept in our minds, when we have become better, there is always another better waiting for us. When will we ever finish this chase and become satisfied? We all seem to have forgotten about this. We think we have to become someone in order to be happy, in order to be successful, but we never realize we will never get “there”. We don’t need to run to the future to find happiness, to be perfect. Happiness is right here, right now. This is the third practice of Right Concentration, aimlessness. What about human? Human forget about this profound truth. The purpose of a rose is just to be a rose, not a tulip, or to be the queen of rose either. However, as a human, we want to be this and be that, everything but a plain human. If you look at yourself now as the sum-total of all the past causes and conditions, you will notice that you have arrived at the perfect place. Can we have a better present than this? No, we have already got the perfect present due to all the past conditions and actions – the present is the perfect consequence of all the past conditions and actions. If you look back at any moment in your past, is there any moment that you could have been better? Given you knew only what you knew, given you were only as skillful as you could be in the past, was there a moment that you could actually be better? For example, this is your first mindfulness session and you have never heard nor practiced mindfulness before. Your friend did something that frustrated you greatly last week, you ended up yelling at her and asking her to go away. You later on regretted your action and wished you could have done better. If we examine that moment, given all your capacity, your level of awareness, your habitual energies, and your emotions at that moment, could you have done better? You already did the best at that very moment. So if you look back at any moment in your life, you would notice each moment is a perfect moment with all the causes and conditions. This moment, right now, you are perfect as the way you are, because the present you is the perfect sum of your past. We do not need to go somewhere in the future, become someone in order to be perfect, to be happy, because we are already perfect. And this is the practice of aimlessness. We do not need to put a goal in front of us and chase after it to become perfect; we have already arrived. The next moment will be the total sum of what we do in the present moment. If we want to have a happy future, we don’t need to get to the future to make that happen, all we need to do is to invest our efforts in the right now. We want to practice diligently everyday, to see our life through the eyes of emptiness, signlessness, and aimlessness. The more we can see the empty, interdependent nature of life, see that the present is all there is, you know that every moment you are living in the Heaven, in the Pure Land.